An inquest into the death of a pilot in a plane crash in Kent that left eight people onboard injured, has recorded a verdict of accidental death. The crash happened in March 2007 when a De Havilland Turbo Beaver plane struck a static display aircraft at the end of the runway at Headcorn Aerodrome. Mr Steven Davis, 36, from Orpington, died at Royal London Hospital the day after the crash. His mother, Sandra Davis, said the family was pleased with the verdict. "Steven had worked hard to fulfil his ambition to be a pilot, and he was well respected and liked by colleagues. He is greatly missed," she said. The inquest began on Wednesday, hearing from an Air Accident Investigation Branch (AAIB) inspector who described how Mr Davis tried to abort the flight. Reading from a December 2007 AAIB report, Mr Julian Firth told the nine-strong jury at Maidstone County Hall that the plane had appeared to accelerate normally. He described how the parachute jump-master said he noticed the aircraft had not left the ground at the usual point on the runway. 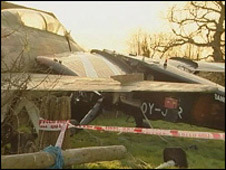 The inquest heard how the left wing and the cockpit of the aircraft then collided with the camouflaged plane which was parked as an exhibit at the end of the runway. Members of the cabin left when emergency doors opened, but Mr Davis remained unconscious in the cockpit. Summarising the findings, a jury member said: "The pilot was unable to slow the plane sufficiently." After delivering the verdict, coroner Stephen Beck said he would recommend to the Civil Aviation Authority (CAA) that unlicensed runways follow the same rules as licensed ones for markings and distances. He also recommended that Headcorn Aerodrome improve markings and operations on the runway where the accident happened. The 2007 AAIB report found that the crash was caused by incorrectly set wing flaps.